Note: This is the bound book only and does not include access to MyLab™ Counseling with Pearson eText. To order MyLab Counseling with Pearson eText packaged with the bound book, use ISBN0134386779. If purchasing or renting from companies other than Pearson, the access codes for MyLab may not be included, may be incorrect, or may be previously redeemed. Check with the seller before completing your purchase. For courses in Community/Agency Counseling. A strong foundation for building counseling skills that addresses the latest CACREP standards. Rapid changes in our worldcompel changes in the way mental health counselors must practice. Focusing on approaches that promote prevention, early intervention, wellness, and advocacy, Clinical Mental Health Counseling in Community and Agency Settings gives today’s counseling students a user-friendly yet scholarly approach to all aspects of their future profession. The Council for the Accreditation of Counseling and Related Educational Programs (CACREP) now recognizes only Clinical Mental Health Counseling (CMHC) programs that have met the accreditation standards; therefore, the authors now focus exclusively on clinical mental health counseling to give students a strong base in this specialty area. 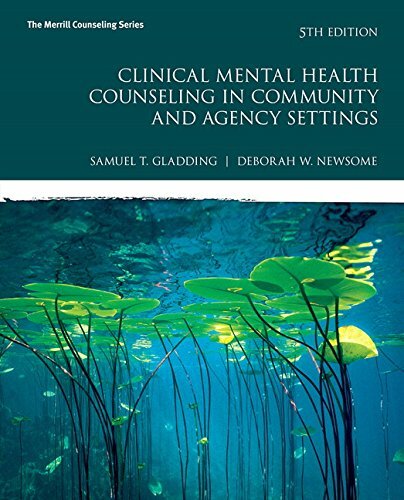 Gladding and Newsomeexamine the history and professional foundations of counseling, legal and ethical issues, counseling with diverse populations, multiple roles and functions of clinical mental health counselors, and the many settings in which clinical mental health counselors practice. Information presented in the chapters is supplemented with narratives supplied by mental health professionals employed across counseling settings, who share their views of the rewards and challenges associated with the services they provide. In addition, case studies in each chapter provide opportunities for students to grapple with challenging issues faced by clinical mental health counselors. This title is also available with MyLab Counseling – an online homework, tutorial, and assessment program designed to work with the text to engage students and improve results. Within its structured environment, students see key concepts demonstrated through video clips, practice what they learn, test their understanding, and receive feedback to guide their learning and ensure they master key learning outcomes.